Build A Hard-Working Workstation With 10500 Series Laminate From Hon, Our Bestselling Desk Collection. This 66"W Left Desk Can Be Combined With A Right Return To Create An L-Workstation. To Create A U-Workstation, Combine With A Bridge And Right Credenza. One Box Drawer Provides Convenient Storage For Office Supplies, And One File Drawer Organizes Paperwork. Laminate Finish Color Is Mocha.. Build A Hard-Working Workstation With 10500 Series Laminate From Hon, Our Bestselling Desk Collection. 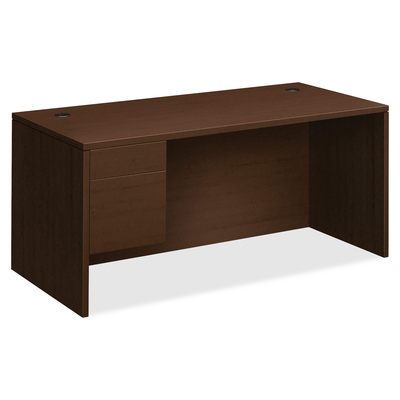 This 66"W Left Desk Can Be Combined With A Right Return To Create An L-Workstation. To Create A U-Workstation, Combine With A Bridge And Right Credenza. One Box Drawer Provides Convenient Storage For Office Supplies, And One File Drawer Organizes Paperwork. Laminate Finish Color Is Mocha.